In Kachin State there are still thousands of IDPs (Internally Displaced Person). Their displacement is the result of fighting that has continued since the breakdown of the ceasefire on 9 June 2011. Over 100,000 Kachin IDPs faced the brutal cold of winter in the mountains with little to no supplies and small shacks to live in. The most critical needs of IDPs are food, security, medicine, and education. IDPs endure a fearful environment, as there is a constant threat of fighting and indiscriminate shelling from Burma Army troops. Relief is far below the international humanitarian standard (which mandates that all persons should be provided with provisions such as a safe environment, adequate food and water, and acces to healthcare) due to ongoing attacks by the Burma Army, insufficient funding and limited access for aid organizations in the remote locations of the IDP camps. IDP sites in Kachin State are within heavy mortar and artillery range of many Burma Army positions. Any IDP site within 11 kilometers of a Burma Army camp is in range of Burma Army heavy weapons such as 105 mm howitzers (which the Burma Army has forward deployed). Camps within seven kilometers are in range of 120 mm mortars. Camps within 4.5 kilometers are in 81 mm mortar range, and camps within 3.5 kilometers are in 60 mm mortar range. 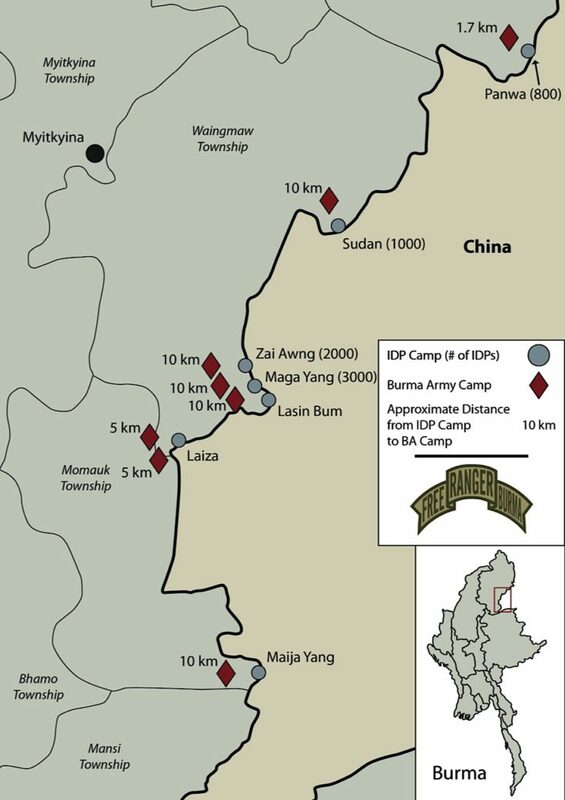 There are 17 IDP Camps situated along the Burma-China Border. The northernmost camp, Hpare Hkyet, is just north of Panwa. The southernmost camp, Hka Hkyeng Zup, is located northeast of Kahtik. 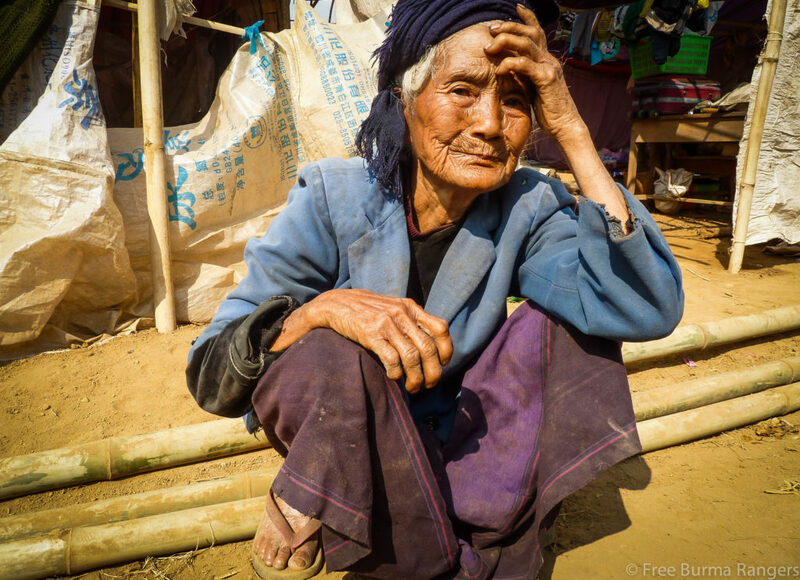 There are over 100,000 Kachin IDPs. Roughly 75,000 IDPs are officially accounted for by the IDPs and Refugees Relief Committee (IRRC), but this does not include IDPs in many other areas, including Myitkyina, Wainmaw, Bhamo, Moe Mauk, Mansi, and Shwegu. 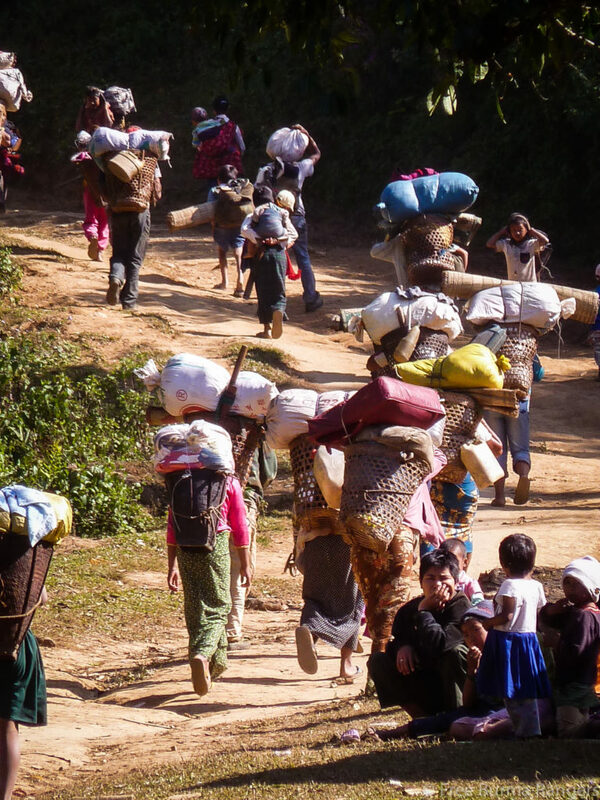 Additionally, there are a substantial number of IDPs that have crossed into Shan State or China, or are scattered throughout the jungle and are thus unaccounted for. Included in the official IDP count are 15,951 children 15 years old or younger. 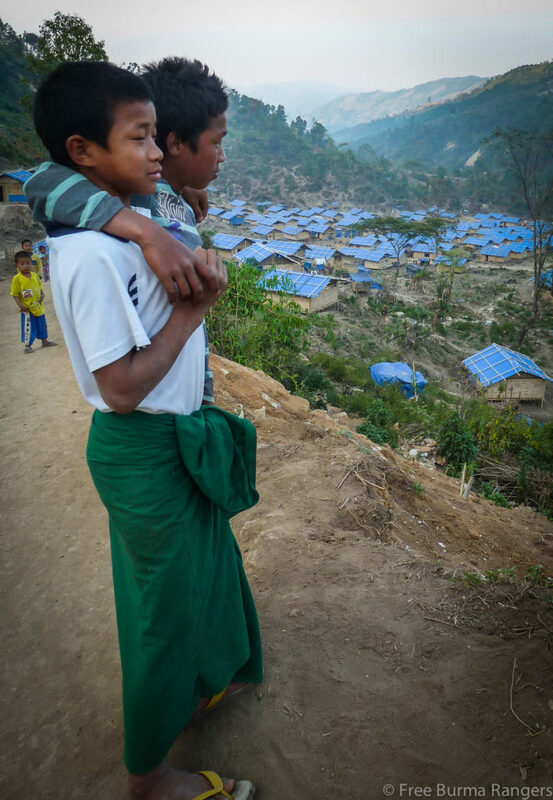 Young Kachin boys look over one of 17 IDP camps that the Kachin have been forced to relocate to because of on-going violence in the area. The Burma Army has attacked civilians, moving beyond just engaging KIA troops in the fight. In January 2013, 105 mm artillery hit civilian homes and civilian bomb shelters in Laiza, the capital city. IDPs in Pang Wa camps were hit by mortars in May 2012, where IDPs as young as 13 sustained shrapnel wounds. A seven-year-old boy in a refugee camp just across the China border was wounded in October 2012 by Burma Army soldiers firing indiscriminately at the refugee camp. Civilians are put at risk through the altered way they must live while their towns have been under attack, especially those who have relocated to IDP camps. Many civilians have begun digging bunkers into the hillsides to protect themselves from Burma Army airstrikes. On 13 January 2013, three young boys were playing in a bunker when it collapsed on top of them, resulting in the death of all three boys. Some IDPs in the Pang Wa area have been living approximately a kilometer from Burma Army positions. 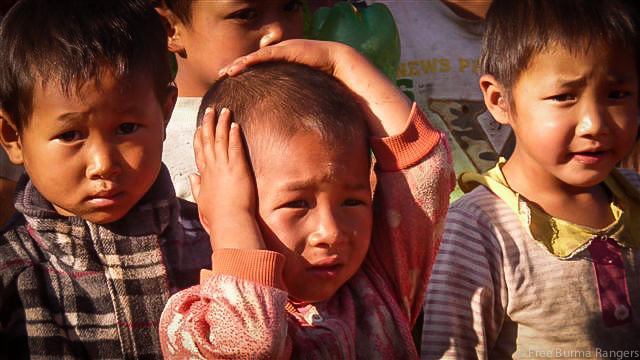 Every time fighting in the area flares up, these IDPs flee across the Burma-China border until fighting dies down. Everyday life is difficult to sustain in Kachin State. In more developed areas, such as Laiza and Mai Ja Yang, city life is shrouded by fighting. There is no room for farming and cultivation, which prohibits many families from earning income. Life for IDPs can be even more challenging. Having left behind their villages, and thus their livelihood, they have no means to earn income and provide for their families. IDPs rely solely on assistance provided by humanitarian organizations. People residing in camps have become susceptible to strains on family relationships, malnourishment, the spread of infectious diseases, exposure to unsanitary water sources, loss of education, and insufficient medical attention. Life in IDP camps is hard. Food shortages, lack of medical care and the close proximity of Burma Army battalions present daily threats to the welfare of camp residents. Over 30 percent of children under the age of 5 are considered either moderately or severely malnourished (statistics from a March 2013 humanitarian briefing from Relief Action Network for IDPs and Refugees (RANIR)). Food shortages pose a threat to IDPs, where 30 percent of children under the age of five are considered malnourished. Fighting between the KIA (Kachin Independence Army) and the Burma Army continues especially in southern Kachin State and Northern Shan State. In all areas the Burma Army continues to resupply and reinforce its troops. The close proximity to the IDPs, the buildup of Burma Army camps and the heavy weapon systems in these areas all pose a real and present threat to the lives of thousands of men, women and children. Though there is a great deal of suffering in Kachin State, and other regions in Burma, positive changes are taking place. We pray for the leaders of the ethnic states and central divisions of Burma as they seek to lead the people here, and that their leadership will guide the people here towards even more positive changes and sustainable peace. Below are raw reports from our Kachin Rangers at the end of April, and at the beginning of May 2013. It provides details on both major Burma Army troop movements and military clashes at locations throughout both Kachin State and Northern Shan State. On 15 May 2013 at 13:00, 4 trucks carried Burma Army troops (unit unknown) and a truck loaded with 105mm artillery arrived for troop reinforcements at Hanhtet village. The previous day, about 200 Burma Army soldiers arrived in territory under the control of 3rd Brigade. On 15 May 2013, 15 Burma Army armored vehciles sent from the Mandalay division arrived at their Northeastern Command base in Lashio. On 14 May 2013 at 20:00, troops led by Captain San Aung from Battalion 2, stationed at Kawnghka village, shot Zinwa Brang, from Loingawm village. The shooting occurred in territory controlled by KIA (Kachin Independence Army) Battalion 8, under 4th Brigade area in Namtu Township. On 15 May 2013 at 11:00 am, a KIA soldier named Nga Tu Mai stepped on a landmine laid by the Burma Army. The explosion occurred between the Bungshi and Kunglaw posts at Pangwa. The landmine blew one of his legs off. On May 14, 2013 from 08:30 – 14:30, 15 armored vehicles from Mandalay entered Tibaw and headed to Lashio, located in northern Shan State. On May 4, 2013 at 18:00, Burma Army Infantry Battalion (IB) 125 sent 80 soldiers to Loilem Bum. One group arrived at Munghtam village in territory controlled by KIA Battalion 2, under 4th Brigade area in Muse township, northern Shan State. On May 5, 2013 at 15:15 – 15:30, due to its offensive raid on them in territory controlled by KIA Battalion 5, under 2nd Brigade, in Monyin township, KIA’s Strategy Regiment ZD 104 defended itself against Burma Army IB 93. On May 5, 2013 at 15:15 – 15:50, KIA Battalion 38 troops and Burma Army IB 242, coming from Munggu, were fighting between Samba and Kila Pa in territory controlled by KIA Battalion 38, under 4th Brigade in Kuthkai township, northern Shan State. On May 4, 2013 at 15:30 – 16:00, KIA Lieutenant Ze Lum’s troops and one column of troops from Burma Army IB 127 fought near Panghkam. 5 Burma Army soldiers were injured or killed in territory controlled by KIA Battalion 17, under 4th Brigade area in Kuthkai township, northern Shan State. On May 3, 2013 at 08:00, eight Burma Army VIPs, escorted by security forces, came to inspect Tahkaw Hka (hydroelectric power dam) in territory controlled by KIA battalion 15, under 3rd Brigade area in Nmawk (Momauk) township. On May 4, 2013 at 06:45 – 11:30, Burma Army Division 33 to have around 200 troops with 27 trucks, including 142 horses, were going back to Myitkyina from Gangdau Yang. They are retrieved after transporting ration, arms and ammunitions to the following posts: Nahpaw, Namsan Yang, Npawn, and Sama (all in Waimaw township). On May 3, 2013 at 17:20, clash between ZD 104 (KIA’s Strategy Regiment) and Burma Army IB 93, which has around 43 troops at Namhkyi, near Bumchyang Bum, in territory controlled by KIA Battalion 5, under 2nd Brigade area in Monyin township, Kachin State. On May 3, 2013 I received word that Operation Command Headquarters 16 commander arrived at Namhkam, under KIA 4th Brigade control area in Namhkam township, northern Shan State, calling upon all frontline commanders for a group meeting. On May 3, 2013 at 04:30, Burma Army troops from an unknown unit, with 2 trucks transporting troops and 200 troops on foot, were going to Mungwi from Namhai, in territory controlled by KIA Battalion 8, under 4th Brigade area. On May 2, 2013 at 20:00, a clash between Shan State Army-North (SSA(N)) troops and Burma Army troops from unknown unit commenced at a hill beyond Mile 12 road, which links Mingpawng to Tangyang, in control area of KIA 4th Brigade. In territory controlled by KIA Battalion 17, under 4th Brigade area in Kuthkai township, northern Shan State. Burma Army troops from IB 127 and LIB 312 fired 60mm and 81mm artillery heavily from Bang Hkam at Manau Bum, Nam Yi and Nam Dau, where KIA troops are stationed. At 07:45: Northern Command, including the division commander, with 6 cars and 2 trucks, went and surveyed LIB 321 and then returned to Myitkyina. On April 23, 2013: Northern Command, including division commander, with 6 cars, went and surveyed IB 58. On April 24, 2013: BA troops were taking up security along Daw Hpum and Bhamo road. In territory controlled by KIA battalion 17, under 4th Brigade area in Kuthkai township, northern Shan State. Burma Army troops from IB 127 and LIB 312 fired 81mm and 60mm artillery from Bang Hkam and launched a raid on Manau Bum and Nam Tau, where KIA troops are stationed. During April 18 – 23, 2013: conflict between KIA and Burma Army troops around Manau Hkyet and Nawng Chu resulted in 32 Burma Army soldiers being injured, and some soldiers from Burma Army militia died in Kun Lung hospital. On April 20, 2013, between 16:00 – 20:40, 10 trucks with troops from LIB 323 and 512 were going along the road from Kai Htik to Nam Hkam in Nam Hkam township, northern Shan State. They traveled through Man Wing in Mansi township, Kachin State, which is territory controlled by KIA Battalion 27, under 3rd Brigade area. On 22 April 2013 at 05:30 – 13:00: We were in a territory controlled by KIA Infantry Battalion (IB) 17, under 4th Brigade area in Kuthkai Township, northern Shan State. Troops from IB 127 and Light Infantry Battalion (LIB) 312 fired 81mm and 60 mm artillery heavily from Kong Hkam hill, Man Lum village and also launched a raid on KIA troops in Man Tau village. At 17:30 Burma Army troops from IB 127 and LIB 312 fired artilleries and launched raid on the same place for a second time. At 17:00 we were in territory controlled by KIA IB 36 and 38, under 4th Brigade area in Muse township. 80 soldiers from Burma Army troop IB 242 arrived at Mung baw Win Seng village via Hka Lum. Around 100 soldiers from Burma Army LIB 568 were on an operation from Loi Lek to Mung Ya. At 10:00 we were at the KIA Center when 50 troops from IB 425 arrived at Hkawk Jang. Earlier they were going to Hka U. IB 426 troops were being set up in position. In territory controlled by KIA Battalion 15, under 3rd Brigade area in Momauk Township. 50 troops from IB 47 were taking up security along Wa Wang Kum Bang. From April 22, 2013 in territory under KIA 5th Brigade control. IB 142 and LIB 387 troops have been taking up security between Daw Hpum and Num Lang in Sub-Daw Hpum Yang Township, Momauk Township.